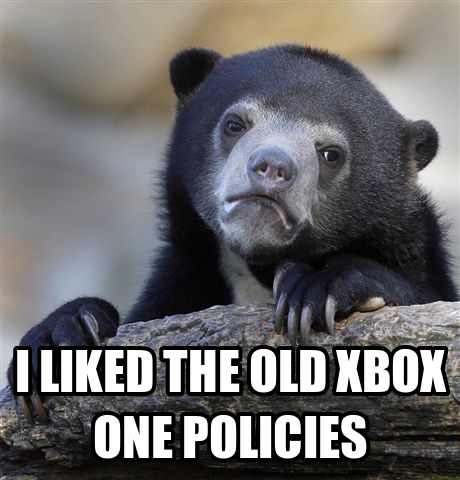 When the Xbox One was announced, I was stoked. Gone were the days of needing to physically change the disc on the console, keep track of where the physical disc is, etc. If the disc was lost, no problem, the game would still work. You could share your gaming collection with 10 others, no need for sharing accounts. But no! 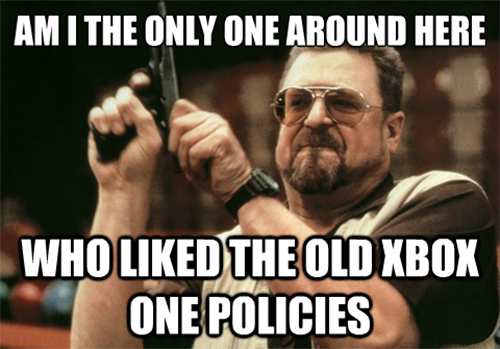 Earlier today all these policies were reversed to that of the Xbox 360, ruining what the Xbox One set out to be. People keep viewing the Xbox One as JUST a gaming console, but it’s much more than that. It’s described as the “all-in-one ultimate home entertainment system”. This is in contrast to the PlayStation 4 that is heavily marketed as a gaming platform. In 2005, Bill Gates had a vision for Xbox to be a product that “fits in the living room”. The Xbox should be a device that does more than gaming, and the Xbox One does so perfectly. The Xbox One had the ability to share a user’s game collection with 10 family members, although there is no check to see if they are indeed family. “It’s not ten different people all playing the game concurrently, but when you think about a real usage scenario, and we thought about it around a family, and I know certain people will create a family group of people that aren’t all part of the same family. PlayStation and Steam doesn’t allow the sharing of games at all. I used to share PlayStation games bought from the PlayStation Store with a friend and would have to enter his account to do so. 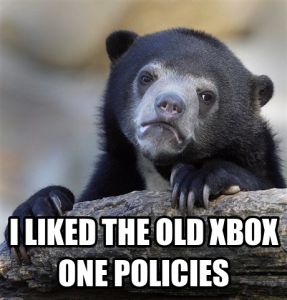 Only one of us would be playing the game at any one time, but with the Xbox One’s policy on sharing, I would have been able to buy a game, share it with a friend, and have both of us playing it at the same time, with each other. One feature I love about Windows Phone which I normally demonstrate to others is the ability for Windows Phone to recover from the Cloud. If I were to lose my Windows Phone, or reset it, I could quickly recover most of my critical data in a few minutes. The Xbox One would have been nearly the same, where the entire game collection is available on the Cloud. Going to a friend’s house without the physical disc wouldn’t be a problem, just sign in and the game would still work because the game is tied to your account. Very similar to Steam, very popular. As a developer, what if I made a paid game, but someone bought and downloaded it once, extracted the .apk (Yes, I’m using Android as an example, no reason in particular), and distributed my game free of charge? I’d be pretty pissed, and that’s precisely what the used game fee sought to prevent. Game developers could even restrict their game from being resold. This would help the ecosystem for the Xbox as it would entice more developers to create games for the Xbox One. A friend of mine did note that I didn’t buy used games, though, so I definitely wouldn’t have problems with this policy (really not a fan of selling or buying used games). The one thing that most people complained about was the 24-hour check-in. I still don’t get what’s the big deal! In this technologically-advanced age, where everything is in some way connected to the Internet, surely a few… BYTES of data wouldn’t cause any problems? Even if we were bringing the Xbox out of the house for whatever reason to somewhere without Internet (again, for whatever reason), would there really be a lack of Internet for an entire day AND EVEN SO, don’t we all have Internet tethering via our mobile phones by now? Then of course, Don Mattrick notes that those without Internet access can get an Xbox 360, and receives a lot of flak for that. But if one actually did stop to think about it, what he says makes a lot of sense. Someone without Internet access wouldn’t have need for an entertainment device, and if they wanted just a gaming device then the Xbox 360 is still perfect! I guess a lot of people had this idea that when the Xbox One comes out, the Xbox 360 will become neglected. They probably don’t know about the free Xbox 360 games for Gold Subscribers, or that Microsoft launched a newly redesigned Xbox 360 that looks like the Xbox One, or that while the PlayStation 3 was released on 17th November, 2006, the last PlayStation 2 game to be released… Hasn’t even come out yet (FIFA 14, 24th September, 2013)! What’s to say this wouldn’t be the case with the Xbox 360 as well. All these critics should have found out more about the sharing functionality and all these brilliant innovations before being so absolutely cynical and complained about it. Especially those who launched that silly ASCII flame war against Xbox’s Facebook page which in my opinion was handled really well. Steam is going to have an upper hand against both (the) PS4 and Xbox One because of Sony’s inability to innovate for the future. 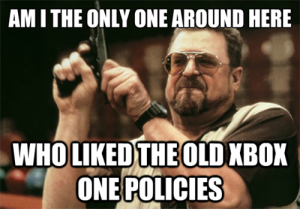 Too bad Microsoft is going ahead with reversing these policies. They really would have made the Xbox One the future of entertainment, but some inconsiderate people had to go and ruin it. At any rate, I’m still going to get an Xbox One AND a PS4 when they come out, because I need my Halo and Kingdom Hearts (yes, I know KH is available on the Xbox One as well). I do hope, however, that removing the region locks and the above policies will help the Xbox One enter Singapore/Asia faster than the late 2014 estimate. Because every single game, physical or digital, would be tied to an account, publishers could create a hub to sell and resell the games digitally. Let’s refer to these as “licenses” from here, even though it’s a loaded term. Here is how this makes sense for YOU: New games could then be cheaper. Why? Publishers KNOW that they will not make money on resold games, so they charge more to you, the first buyer. You are paying for others’ rights to use your game in the future. If the old system had gone into place, you would likely have seen game prices drop. Or, at the very least, it could have staved off price increases. You also would have started getting a better return on your “used” games—because a license does not have to be resold at a diminished rate. How do you know that this would have been the case? Because that’s exactly what happens on Steam. But wait!, you shout. Steam is CHEAP cheap, and it has crazy sales. We love Steam! Micro$oft is nothing like that. Well, no, it isn’t now, but Steam was once $team, too. It was not always popular, and its licensing model was once heavily maligned. Given time, though, it’s now the only way almost every PC gamer wants to play games. Also, the used-game fee was never officially announced! I find it hard to believe, by the way, that someone who could purchase the Xbox One doesn’t have a smartphone capable of tethering a small amount of data. Not everyone can afford to buy games at full retail price and often those same people need the extra few dollars they get from selling their game in to afford something new. Also keeping in mind companies that enable you to buy and sell used games will lose some business. Now as far as your opinion on the internet connection not everyone has a smart phone for one and not to mention most cell phone carriers no longer have unlimited data usage and require an additional fee every month to be able to tether (although there are ways around this it still costs more money). Also there are times when people’s internet provider has an issue and sometimes cable/internet is out for a couple days until the issue is resolved. You seem to be the one that is inconsiderate. As Bruno said Microsoft is more than capable of releasing two different versions of the XBOX one. Another thing to keep in mind is they were keeping the MAJORITY of people’s thoughts in mind when they changed these policies back, had they only had a FEW complaints they would have left it the way it was. It just means Microsoft is listening to their consumers.